← Saying ‘No’ to Garden Gnomes? Photo courtesy of Perennial Entertainment. 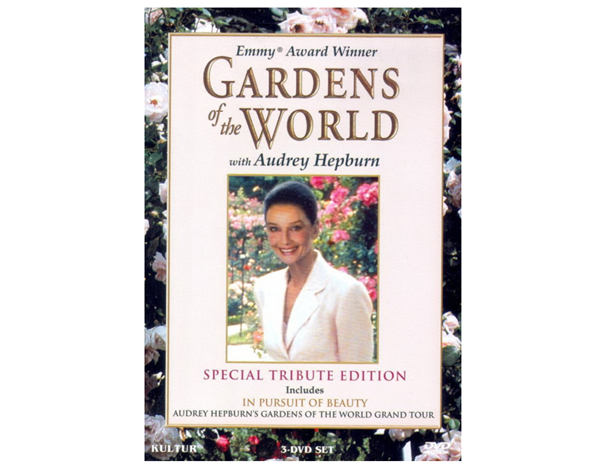 A screen legend’s final performance: Audrey Hepburn in the world’s great gardens. What’s old is new again! If you can still remember the 1990s, you may recall Gardens of the World, the eight-part PBS series in which Audrey Hepburn, the elegant leading lady of Hollywood’s golden age, took viewers on tours of some of the world’s most notable public and private gardens—including George Washington’s estate Mount Vernon in Virginia, Claude Monet’s gardens at Giverny and Jardin du Luxembourg in Paris. Visually sumptuous and profoundly informative, each episode took an in-depth look at a different garden theme, delving into matters of aesthetics, history and environmental significance. The perfect gift for gardeners longing for the return of spring. Available on Amazon.com, new and used, from $14.70 to $49.94. This entry was posted in Documentaries, Uncategorized, Videos and tagged Audrey Hepburn. garden documentary, Country Gardens, English Gardens, Flower Gardens, Formal Gardens, Gardens of the World, Japanese Gardens, Monet’s gardens, Mount Vernon, Mt. Vernon, Public Gardens, Roses and Rose Gardens, Spring Bulbs, Trees, Tropical Gardens, Tulips. Bookmark the permalink.